Physical layer is the lowest layer of the OSI reference model. It is responsible for sending bits from one computer to another. This layer is not concerned with the meaning of the bits and deals with the setup of physical connection to the network and with transmission and reception of signals. Following are the various functions performed by the Physical layer of the OSI model. Representation of Bits: Data in this layer consists of stream of bits. The bits must be encoded into signals for transmission. It defines the type of encoding i.e. how 0's and 1's are changed to signal. 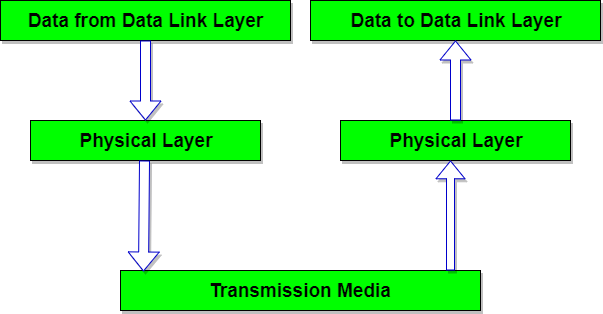 Data Rate: This layer defines the rate of transmission which is the number of bits per second. Synchronization: It deals with the synchronization of the transmitter and receiver. The sender and receiver are synchronized at bit level. Interface: The physical layer defines the transmission interface between devices and transmission medium. Line Configuration: This layer connects devices with the medium: Point to Point configuration and Multipoint configuration. Topologies: Devices must be connected using the following topologies: Mesh, Star, Ring and Bus. Transmission Modes: Physical Layer defines the direction of transmission between two devices: Simplex, Half Duplex, Full Duplex. Deals with baseband and broadband transmission. The Physical Layer is concerned with transmitting raw bits over a communication channel. The design issue has to do with making sure that when one side sends a 1 bit, it is received by the other side as a 1 bit and not as a 0 bit. How many volts should be used to represent a 1 bit and how many for a 0? How many nanoseconds a bit lasts? Whether transmission may proceed simultaneously in both directions? How many pins the network connector has and what each pin is used for? The design issues here largely deal with mechanical, electrical and timing interfaces, and the physical transmission medium, which lies below the physical layer.